Tie-Breakers are the rules and criterion that dictate team standings. Typically several tie-breaker criterion are specified to be applied in sequence in order to unambiguously determine each team's standing. Well-known tie-breaker criterion include winning percentage, games back and head-to-head comparisons, but oftentimes it is necessary to rely on lesser known criterion such as common opponents and schedule strength. And when all else fails, the traditional coin flip can come into play. Different sports use different scoring units. Softball and baseball use "runs", soccer uses "goals", and basketball uses "points". For the remainder of this help screen, the term "runs" will be used as the scoring unit, but it should be understood that the same tie breaking concepts apply regardless of the sport and its particular scoring units. QuickScores provides 25 different tie-breaker criterion and allows the league administrator to specify up to 12 different criterion in a specific order of application. Most leagues will only need five or six different criterion. On the organization's Setup page, the administrator can define a different tie-breaker sequence for each sport. When a tie-breaker sequence is submitted on the Setup page, that sequence is instantly applied to all existing leagues of that sport and that sequence is used to initialize any future leagues of that sport. On a particular league's Options page, the administrator may choose to override the tie-breaker criterion for that one league. The standings table at the top of the league will always display the team names and the number of wins, losses and ties. The league administrator specifies which of the tie-breaker criterion are displayed in the standings table. Associated with each tie-breaking criterion is a selector that indicates whether the results from that criterion should Always be displayed, Never be displayed, or displayed As Needed, meaning that criterion was needed to break a tie in the standings. The following defines the 20 available tie-breaking criterion. Describes where a team stands relative to the best team in the league. The best team in the league is the team with the largest difference between the number of wins and losses, and is defined as being zero games back. The number of games back is the number of times a team would need to beat the leader in order to be tied with the leader in the standings. The Games Back number may include halves. If, for example, a team is 1.5 games back of the leader, beating the leader once will put this team just behind the leader, while beating the leader twice will put this team ahead of the leader. The number of wins plus half the number of ties, divided by the total number of games. Note: If two teams are tied on Winning Percentage and have played a different number of games, the Games Back tiebreaker is used as a mini-breaker. Thus, a team at 4-0 will be placed ahead of a team at 3-0, because the team at 3-0 is considered .5 games back. A comparison of two or more tied teams based on who has won or lost when playing against each other. Games played against non-tied teams are ignored. If a team is not tied, its head-to-head (HTH) column is blank. If two or more teams are tied, but the HTH algorithm cannot determine how to rank the teams, then the HTH column will show "--". If teams are tied and enough games have been played to make conclusions, each team will be assigned a HTH number such as 1, 2, or 3. In ambiguous situations, such as the circular case of A beating B, B beating C, and C beating A, all of the teams will receive the same HTH number. QuickScores offers four different Head-To-Head algorithms. (1) HTH - Our recommended version that is used by a large majority of our clients. 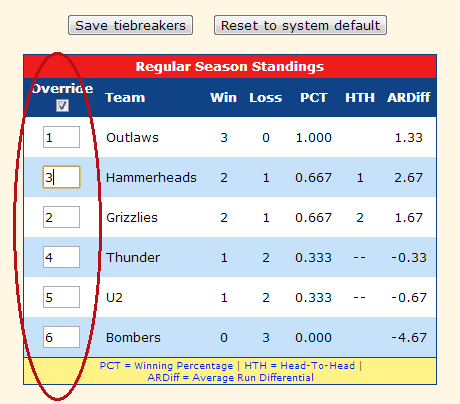 (2) HTH Two Only - Only rank teams if two teams are tied. (3) HTH All Play - Only rank teams if all tied teams have played all other tied teams. (4) HTH Group - Rank teams based on winning percentage against the group of tied teams. To understand the details of how QuickScores calculates the HTH rankings for any number of tied teams, and to understand the differences between the different algorithms, download this paper. This criterion calculates the total run differential, limited by the Max Differential parameter, for games played between pairs of tied teams, and determines which is the better team. After doing such a calculation for all possible pairs of tied teams, the Head-To-Head algorithm is applied. This criterion is most useful when two teams are tied, they have played each other more than once, and each team has won at least once. This tie-breaker rewards the team that has won by the larger margin. This criterion uses the total run differential, limited by the Max Differential parameter, for games played between the tied teams. The larger the number the better. Essentially the total number of runs scored by this team in all games, minus the total number of runs scored by the team's opponent in all games. Some league administrators are hesitant to use Run Differential as a tie-breaker because it could encourage dominant teams to run up the score on weaker opponents. To counter this tendency, the administrator can specify a Max Differential, which is the maximum number on the run differential that can be earned in any single game. For example, if the Max Differential is set to 10, the winning team gains no advantage by running the lead up to more than 10 games. If the Max Differential value is set to zero, there are no limits and the run differential in a game will be tallied no matter how large it is. The higher the number the better. The total run differential as described above, divided by the number of games played. The higher the number the better. The sum of all the runs scored by the team in all games. The higher the number the better. The sum of all the runs scored by the team in all games, divided by the number of games played. The higher the number the better. The sum of all the runs scored by the team in all games, but each game score is limited by the Max Differential parameter. The higher the number the better. The sum of all runs scored by the team's opponent in all games. The lower the number the better. The sum of all runs scored by the team's opponent in all games, divided by the number of games played. The lower the number the better. The sum of all the runs scored by the team's opponent in all games, but each game score is limited by the Max Differential parameter. The lower the number the better. Most commonly used in soccer and hockey, points can be assigned for a game won, a game lost, a game tied, and for some number of runs/goals scored during the game. The higher the number the better. The administrator has the option to manually adjust a team's points for whatever reason they see fit. Some clients give positive points if a team's coach attends the preseason coaches meeting. Other clients give negative points for on-field misbehavior, such as getting a red card in soccer. A comparison of teams based on their winning percentage against all common opponents. If the tied teams haven't played any common opponents, "--" will be displayed. A comparison of teams based on their total run differential against all common opponents. If the tied teams haven't played any common opponents, "--" will be displayed. If two teams have identical records and one team achieved that record having played several very tough opponents while the other team played several weak opponents, the team with the tougher opponents will be ranked higher. There are two different methods for calculating SOS. SOS1 - The average winning percentage of all opponents played, calculated by adding up the total number of wins by all of a team's opponents and dividing by the total number of games played by those opponents. The higher the number the better. This is the formula used by the National Football League. SOS2 - This formula (formerly used by the college football BCS) goes a step deeper and tries to take into account both the strength of a team's opponents as well as the strength of their opponents' opponents. Refer to the Wikipedia entry for the exact formula. A count of the number of games forfeited by a team. The smaller the number the better. The number of games played where the opposing team had a zero score. The team with the larger number of shutouts is ranked higher. The total number of games played. This is usually paired with, and immediately following, the Calculated Points tie-breaker. The lower the Games Played number, the better. When all other tie-breakers fail to discriminate between two teams, a coin flip will always break a tie. Whenever a team is added to or deleted from a league, every team in the league is assigned a unique random number starting with a low of one. If two teams are tied and a coin flip tie-breaker must be used, whichever team has the lower random number assigned to it wins. Because each team has a unique number, these pre-assigned coin flip numbers work equally well if there are three or more teams tied. Although QuickScores automatically calculates the random coin flip numbers, the league administrator may override those computer-generated numbers with the results of a physical coin flip. On a league's Options page, the administrator can manually change the coin flip numbers, as shown in the sample table below. Using the "Value" input box, the administrator can manually reorder the teams' coin flip numbers. The Value input accepts decimal numbers and will automatically re-number the events with integer values after submission. For example, if you want the 4th item in a list to become the 2nd item, change the "4" to "1.5". After clicking "Save tiebreakers", the team with "1.5" will be re-numbered as "2" and all other teams will be moved down the list accordingly. With this flexibility, the administrator can manually represent physical coin flips for any number of teams that may be tied. If the league administrator wishes to override the calculated league standings, he can click the Override checkbox at the top of the standings. He will then be presented with boxes where the desired order of ranking can be entered. After clicking "Save tiebreakers", the manual ranking will be shown to the public forever... until the manual rankings are changed or turned off.